Themed chess sets have become hugely popular of late and there are literally hundreds to choose from. The concept behind a themed chess set is one where each piece on the chess board represents a character or icon from a popular or well known theme. A themed set may be based on a film, TV show, a city or an event in history. A themed set is often a great way of selling a chess set to someone who isn't usually in the market for one, but is such a big fan of the theme that they can't resist buying it. Themed sets make for excellent centerpieces, but are generally not very functional for actually playing a game of chess. The main reason being that identifying which characters represent which piece can be a struggle. To complain of this would be rather missing the point however, as themed sets are generally for show and the very occasional game of chess. 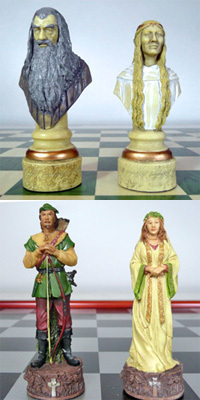 Themed chess sets are generally mass produced rather than being hand made and are often made from molds, either from plastic, resin or crushed stone. It's not uncommon for the pieces to be painted, sometimes by hand. Studio Anne Carlton are a very well known producer of themed chess sets, indeed they manufacture the legendary Lord of the Rings chess set that has seen extensive popularity since the films revitalized enthusiasm for Tolkien's books.